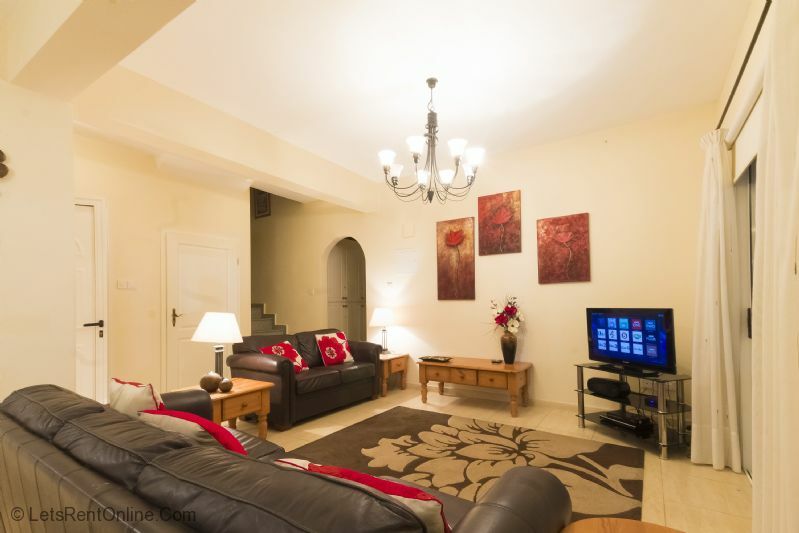 The fully air-conditioned property has a large open plan lounge, dining and kitchen area with large brown leather sofas having views of the television with satellite and DVD (UK channels), and through the patio doors into the mature garden and pool area. 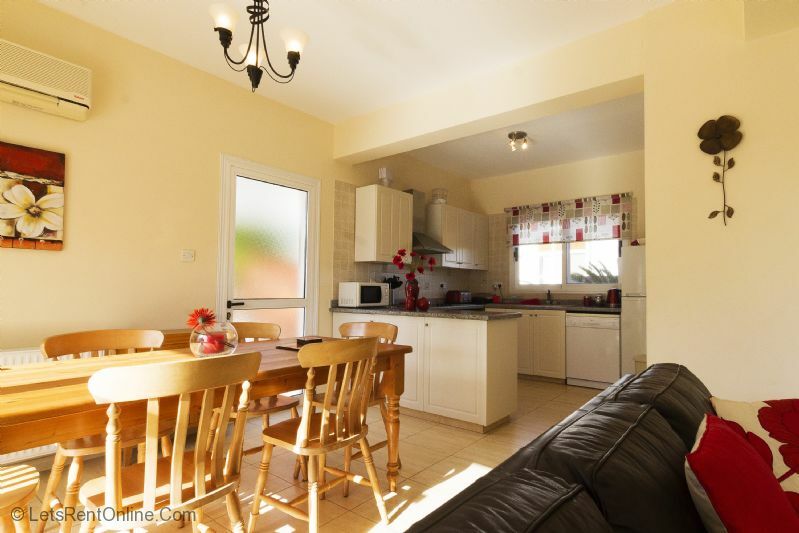 The inside dining area is adjacent to the kitchen which is modern and well equipped (dishwasher included). 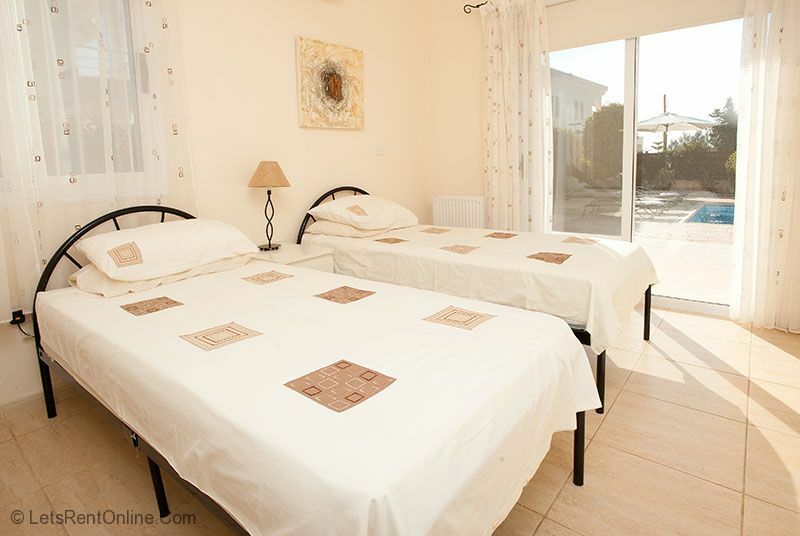 Making up the ground floor is a very nice twin bedroom with adjacent bathroom which includes a shower cubicle. 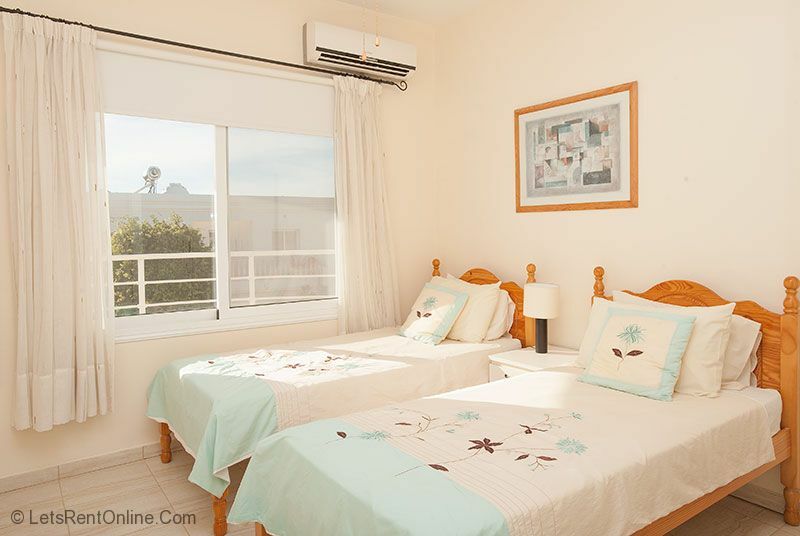 The bedroom has patio doors out to the garden and pool making it a very private and self contained area. Upstairs leads to 3 further bedrooms which again are of a good size, the master having a double-sized bed and en-suite which (with bath & shower). The twin room and further double-sized room share a shower room. 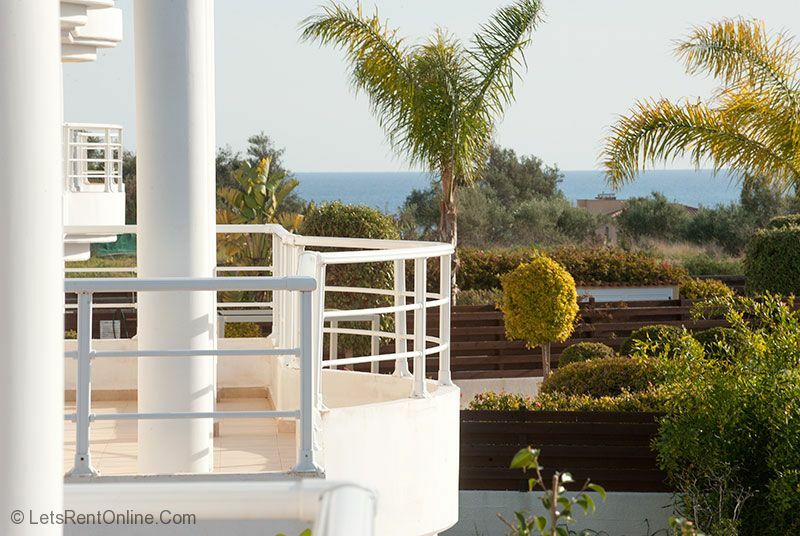 A balcony runs the full length of the upstairs, facing south and affording views of the immediate leafy neighbourhood over to the Mediterranean Sea. 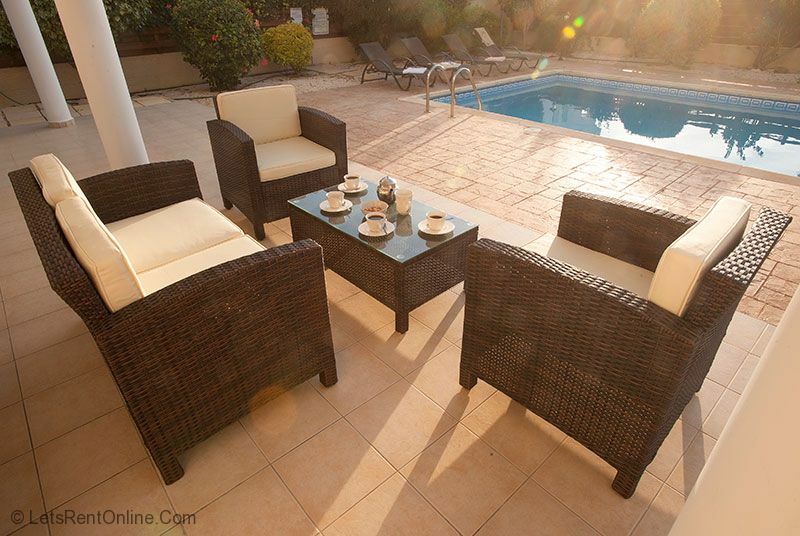 This is a great area to sit in peace and quiet, have breakfast or a coffee and relax and enjoy the Cyprus sunshine. 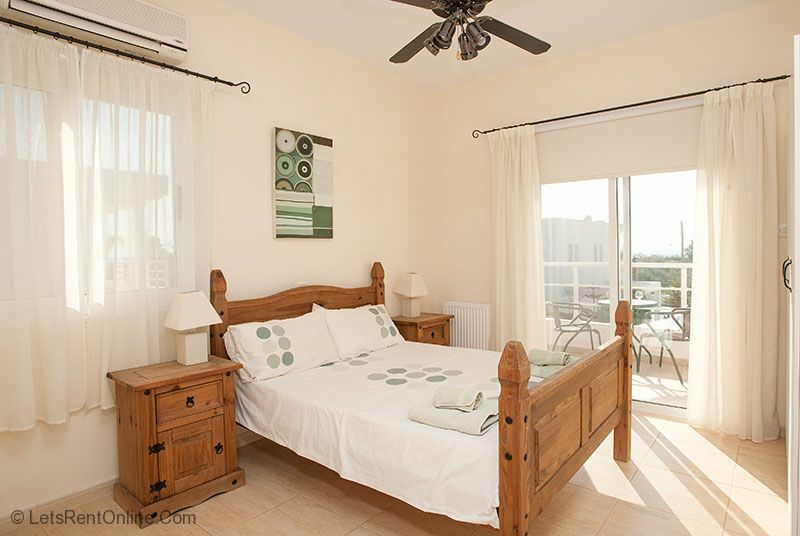 All bedrooms feature black-out blinds and ceiling fans. Travel Cot and Highchair are available for infants upon request and an extra folding bed can be provided if necessary. Flyscreens have been fitted to windows throughout to allow circulation. 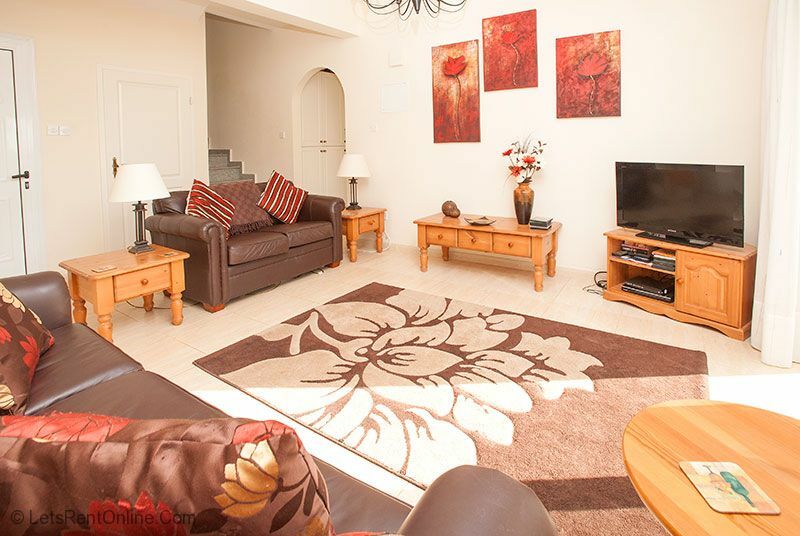 The villa has central heating making it suitable for Winter bookings. This is included in the rental rate from December to February. Wi-Fi is also included in the rental rate. Outside, the gated driveway can accommodate 2 cars and leads to the front of the house and round into the rear garden area. 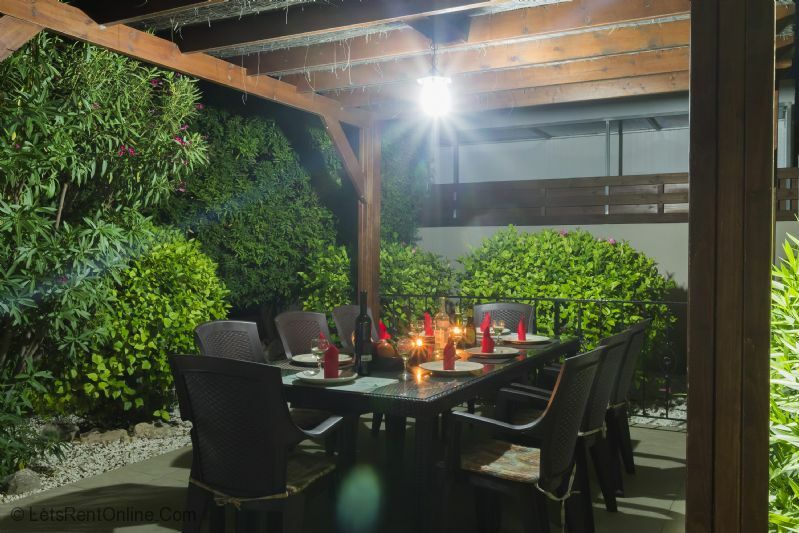 The rear garden has been carefully landscaped and has a 10m x 5m private pool as its centrepiece. The garden has been fenced to the sides and rear with a large tree at the rear for further privacy. A sofa set is provided on the terrace to allow relaxing morning coffees or pre-dinner apertifs and the pergola with table and chairs to seat 8 means alfresco dining at all times of day. 8 sun loungers and provided as are 2 parasols and a Gas BBQ. An outside pool shower is provided for convenience and for cooling off on those hot summer days. 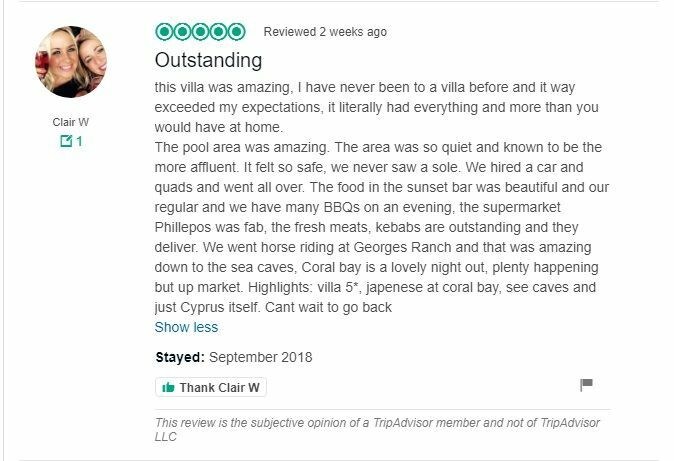 ''First Day back at work for me unfortunately, We all had a lovely Holiday in Cyprus thank-you – my family from Dubai left and arrived home yesterday whilst we left the property on Saturday. 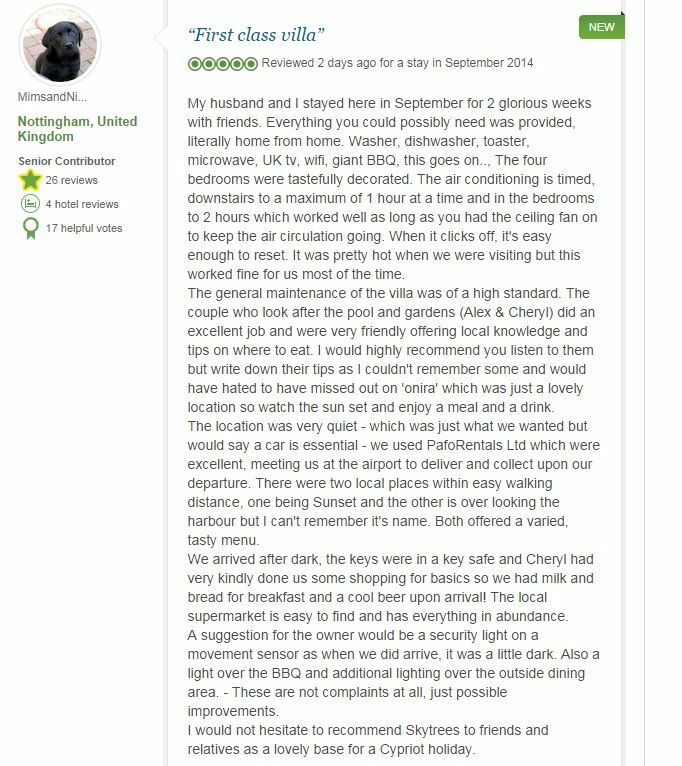 We were all very happy with the facilities at Skytrees – it was very handy for Coral Bay and the children enjoyed their time there, we felt it very safe. We ate at several local Restaurants, which were all very good value for money and catered for the children well. Communication from yourself was very good and we found the instructions from the Airport very useful, especially as we were arriving in the dark. Thank-you for your help and support.''. ''Absolutely amazing villa. Fab location, very quiet , it felt safe , minimal noise. Sunset bar is gorgeous, Japanese in coral bay , sea caves. First class service from you and local managers were excellent. Everything perfect. Thank you to all concerned ''. 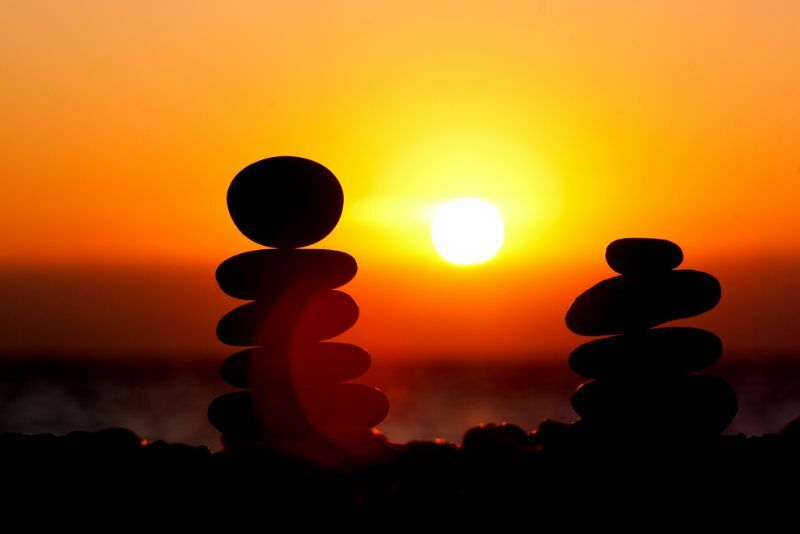 ''Had a lovely holiday thank you. The villa was lovely spacious pool and garden beautiful. Location was great definately need a car which we always get. Sunset and duomos restaurants are our favourite. Also used traffic rentals for a 3rd year for a quad safari, coralia beach is lovely not as crowded as coral bay beach. If you have kids pathos waterpark is great. Service was excellent from let's rent online couldn't fault them. The local managers were very quick and efficient with helping with any enquiry.''. 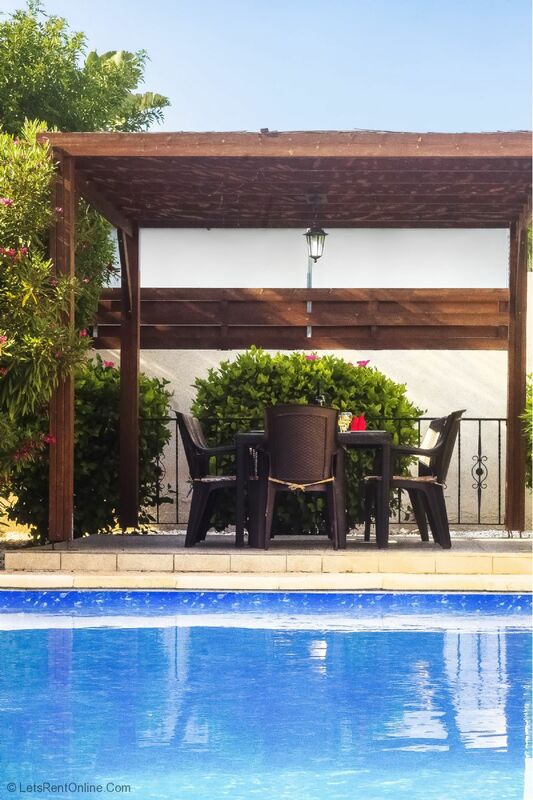 ''The villa was excellent, well equipped and everything was comfortable. 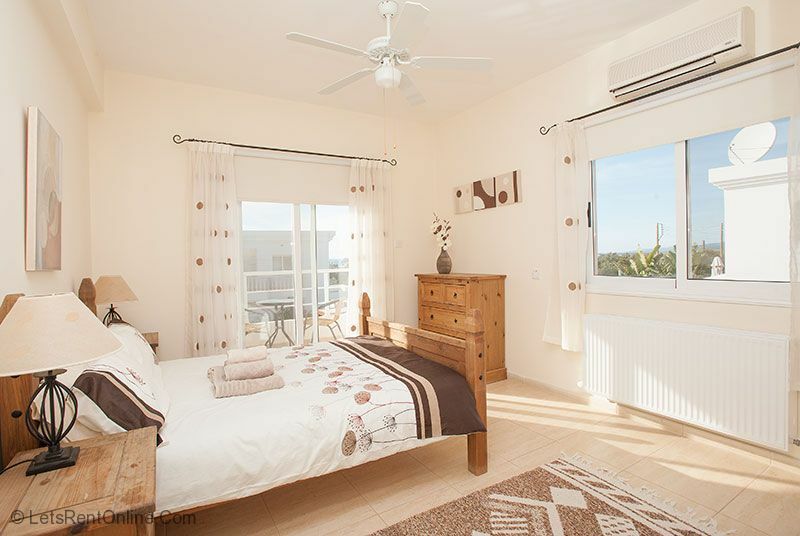 The location was superb, within walking distance of choice of restaurants and a lovely walk to the beach and easy drive to large supermarket. The Beach Club restaurant is in a superb setting and good food and attentive staff. The Sunset was ok but the owners were really lovely. Letsrentonline staff were very helpful and speedy to respond to all communications. We only communicated with the agent not the local managers. Regards Denise''. 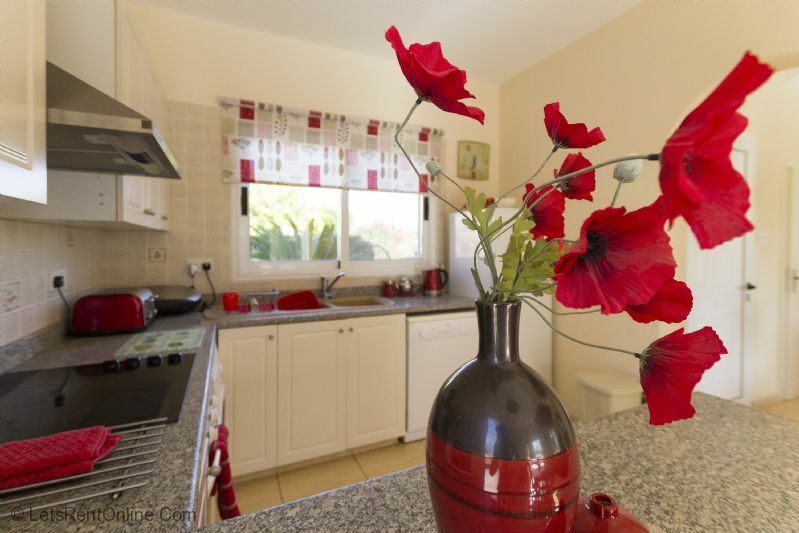 ''Nice, spacious, clean, well equipped Villa. 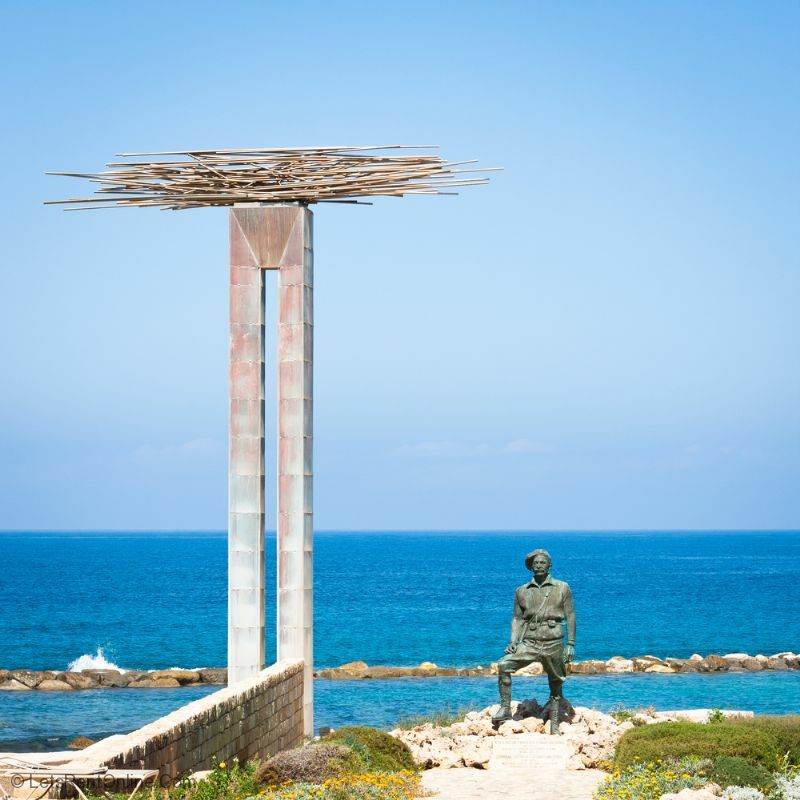 We liked the location on the "edge of civilisaton", where on one side you have wild areas of Akamas and on the other side a supermarket just within 7 minutes drive and eating places just around the corner. Lara beach, hike in the nearby gorge, Paphos zoo for kids, walk along the coast till the coastal caves, nearby Cypriot tavern, renting a self ride boat at Latchi, drive along the coast from Polis to Kato Pyrgos, trekking in the Paphos Forest near Stavros pis Tsokas and picturesque drive in the mountains. Very satisfed with all service. 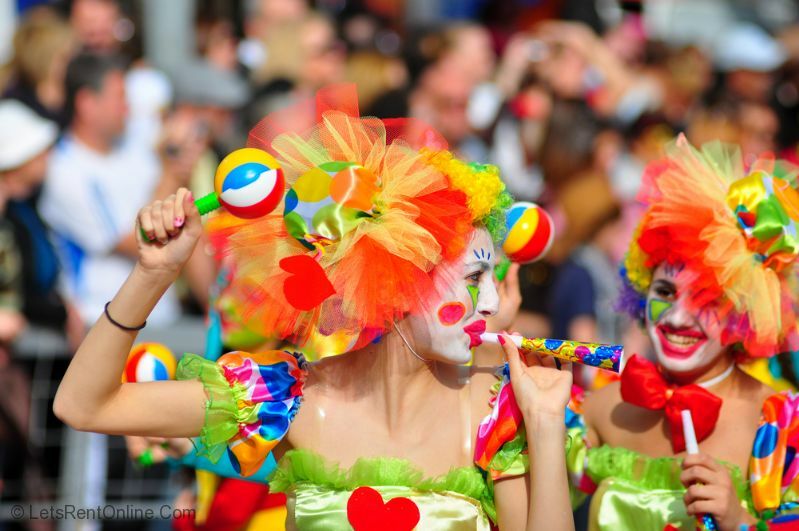 Best regards and thanks for everything! Peeter''. 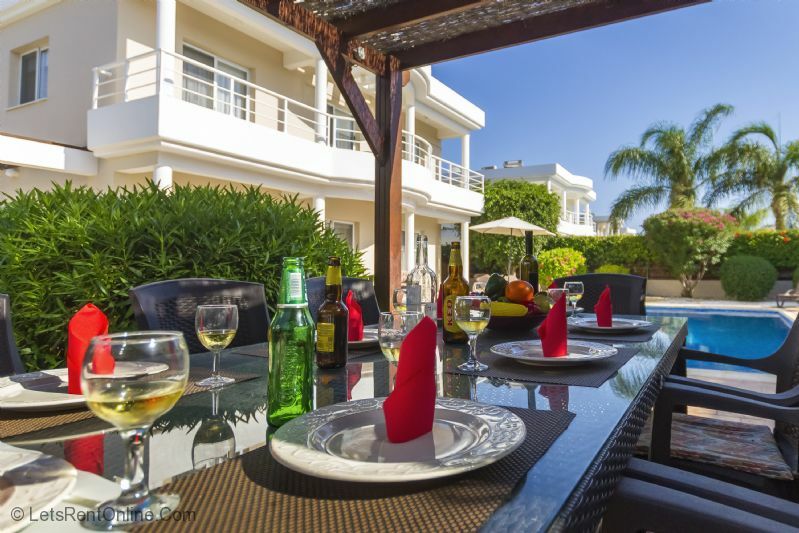 ''The villa was great and well equipped. Location was a little bit far away from the Coral Bay, but it wasn’t really important as we had cars. On our last night we had a dinner in Peyia village in a restaurant called “Cousins tavern”. There was good food and really quick service. We were really satisfied with the service provided by Your agents.We did not have a need to communicate with local manager or owner. Everything went smoothly.''. 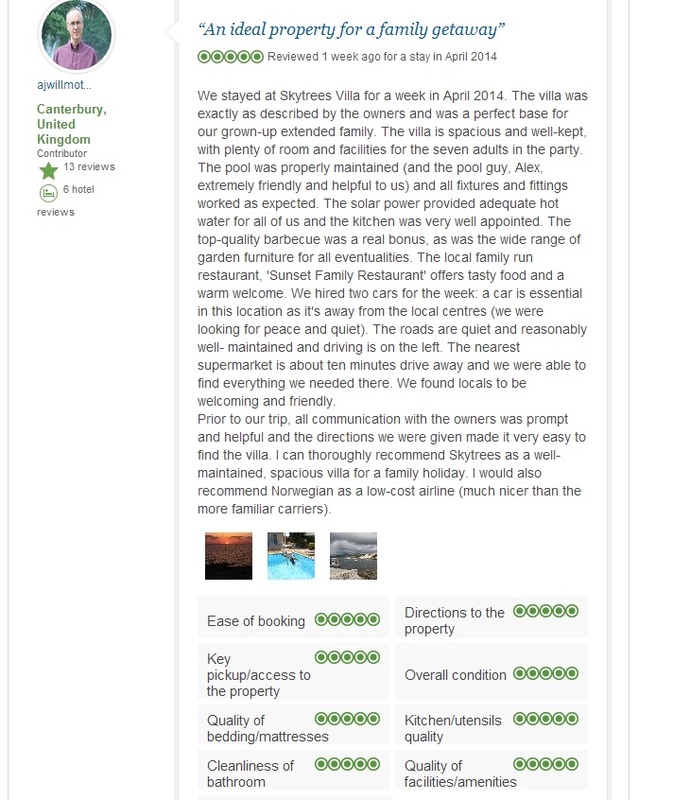 ''Excellent villa. Excellent location too. 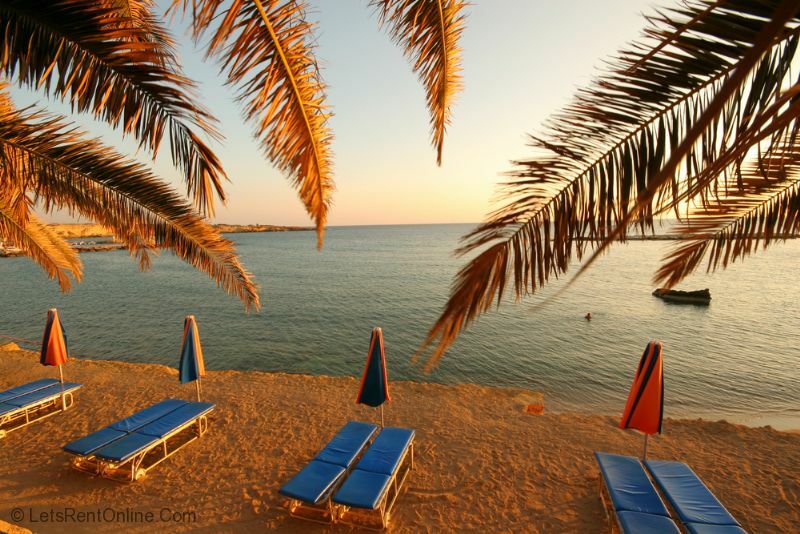 We would highly recommend Coral King Restaurant in Coral Bay and Lara Beach. Fantastic service from you and we were also satisfied with the local managers. We have no suggestions to improve it''. 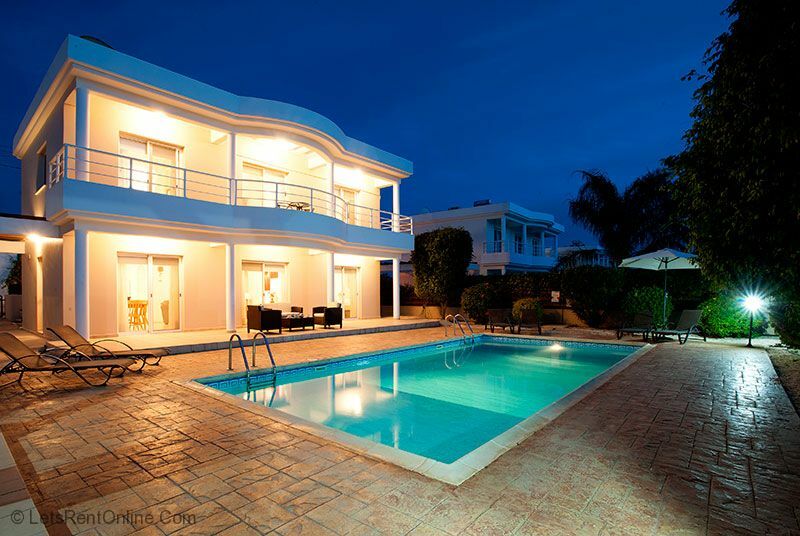 '''The villa was really lovely. All rooms were of a good size and spacious. Having air conditioning throughout the villa as well as fans in all rooms meant that when we were in the villa we could keep cool. There was plenty of equipment available to use in all areas of the villa. 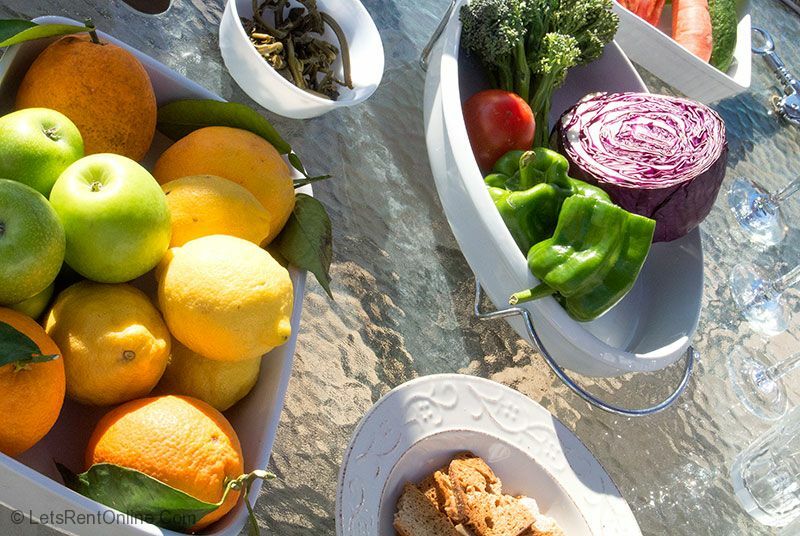 It was very clean when we arrived and felt very welcoming that milk, bread and various items had been left for us. The pool was a good size and spotlessly clean. The pool was cleaned twice while we were there and the gentleman who came to do it was very pleasant. There were enough sun beds as well as chairs and tables for everyone. There was also a bbq available but we did not use it as we mainly ate out in the evenings. The garden was also done on one of the days and was left extremely tidy. 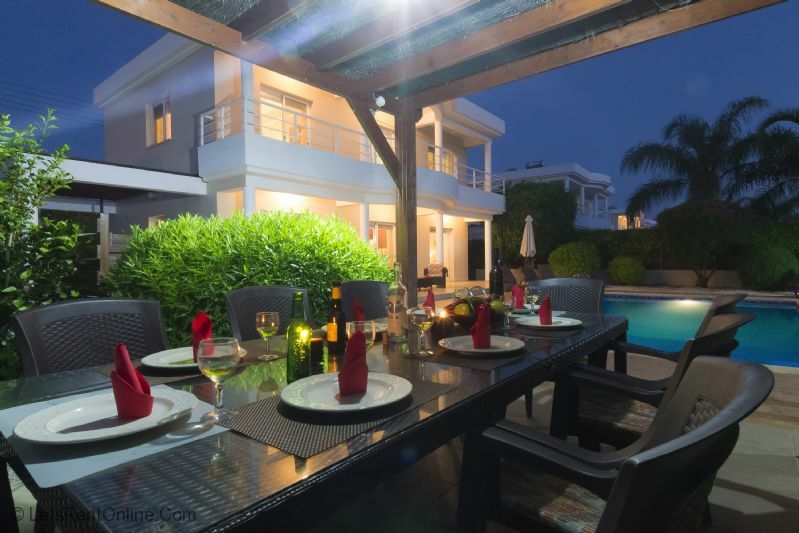 ''The villa was lovely thank you and we had a great holiday. I hope it was ok, you shouldn't have come across any problems. Many thank to you and your team for everything from the initial booking to queries while we were there to your communication on return. First class!! The property was perfect, very big, excellent pool. A little bit off the beaten track. 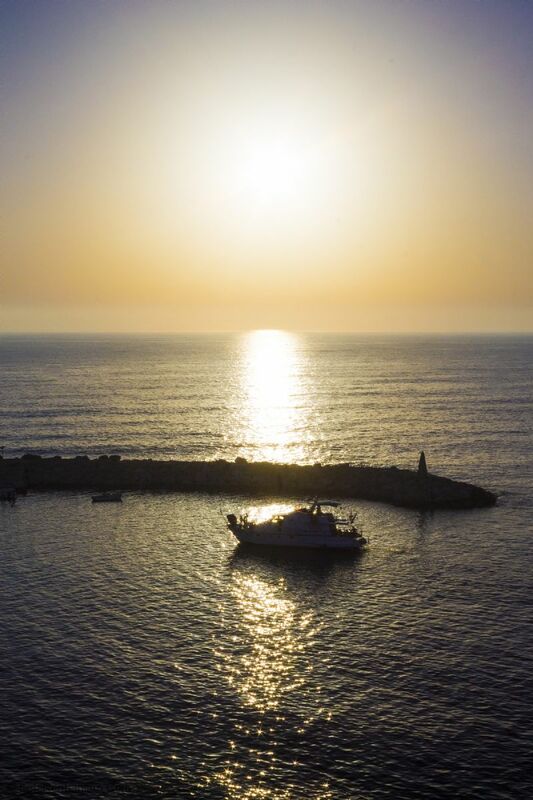 We were disappointed the bus between the villa and coral bay stopped at 430pm and didn't continue into the evening but the bus routes that were available were 1st class and very reasonably priced. Buses to/from paphos run every 10 minutes right up until 1230 at night. Jeep safari was excellent, so was the water park, Lara beach was lovely as is the first beach at coral bay before the last bus stop. Very satisfied with all serviced received. 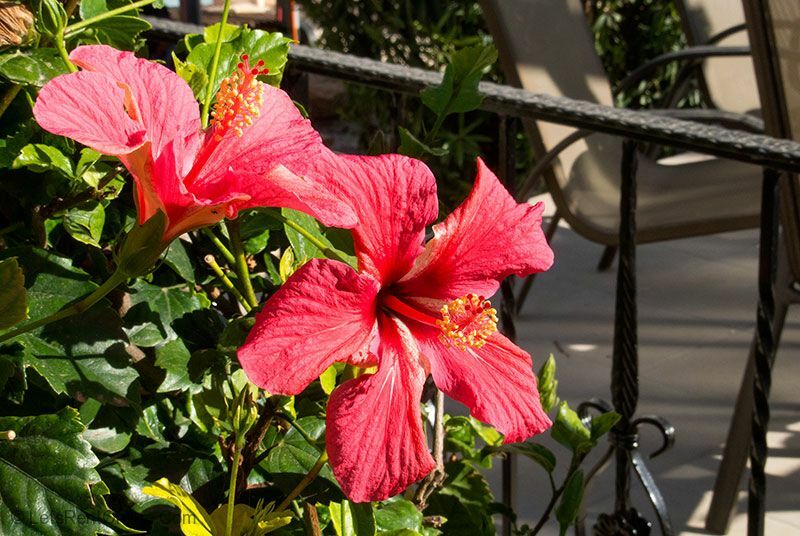 ''The villa was excellent, better than we expected and suited our needs. Had everything we needed and enough space. The location was good. We hired cars so we were able to get out and about. I couldn't imagine staying there without a car though, so I would say a car is essential. 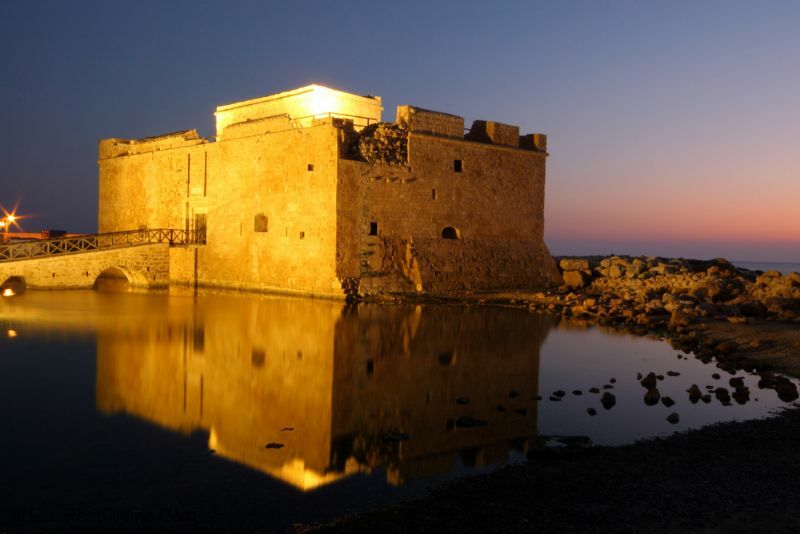 We recommend Paphos archeological park and latchi beach, the drive through the mountains to get there is amazing. We ate out a few times, but we preferred to cook for ourselves. 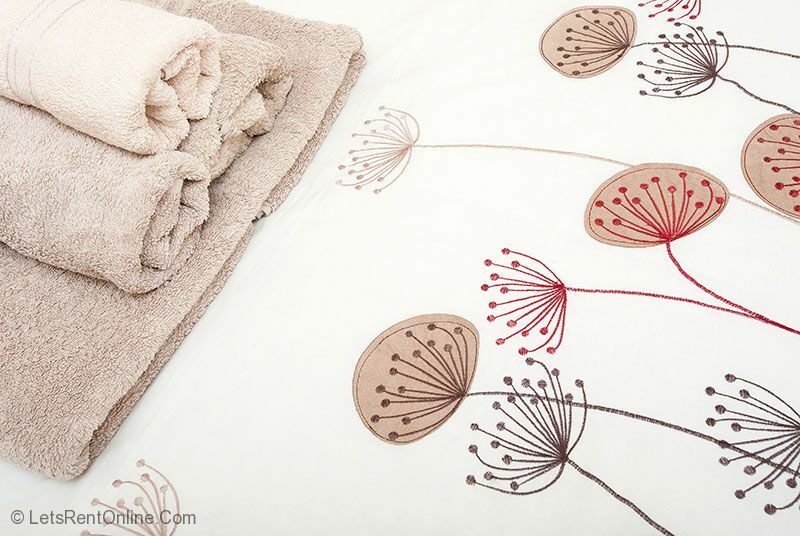 We were very happy with the service and info that we received. 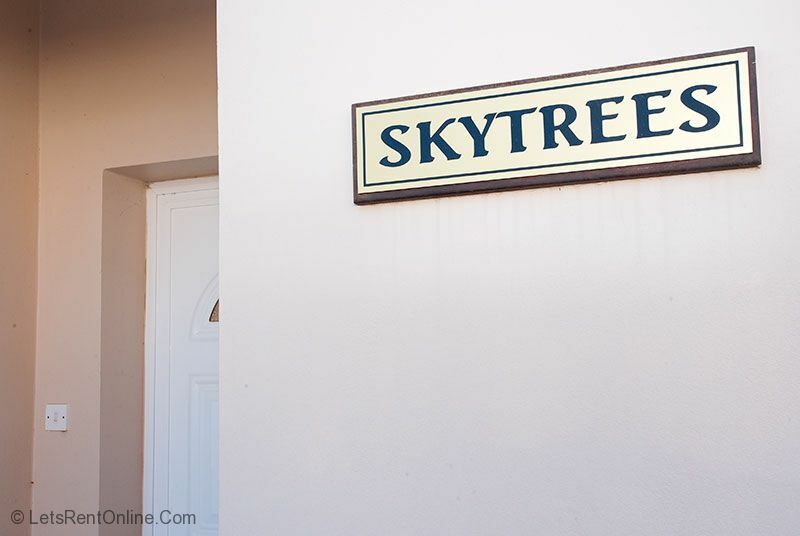 If we did visit Cyprus again we would definitely try to book Skytrees again and will recommend to family and friends. 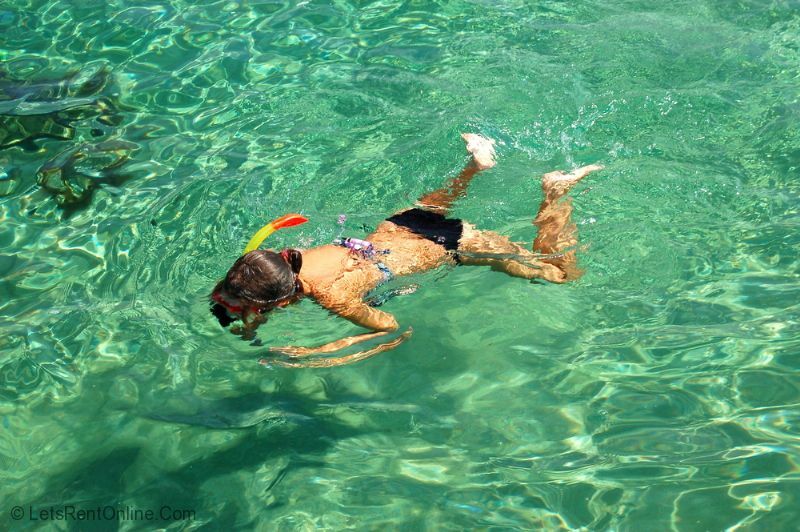 We enjoyed the freedom a villa gave us and had everything we needed for travelling with children''. 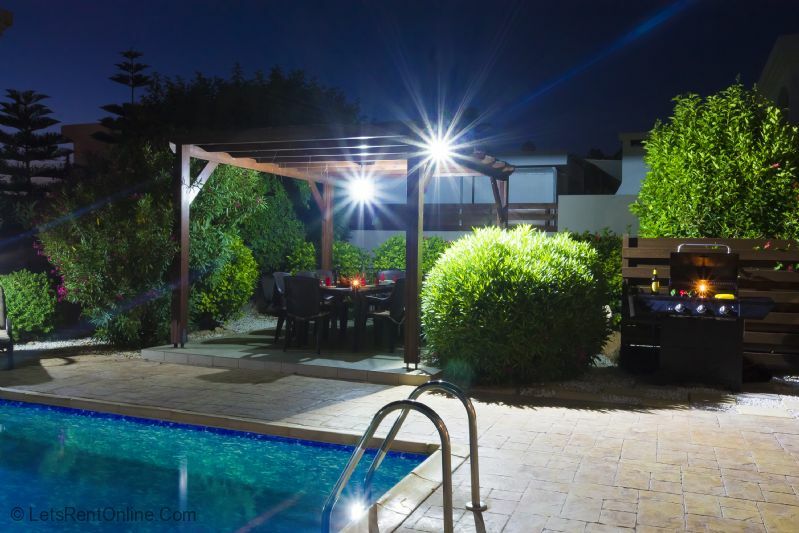 In walking distance of the Skytrees villa are 4-5 traditional tavernas serving BBQ'd meat, Fresh Fish and local dishes of the highest quality. 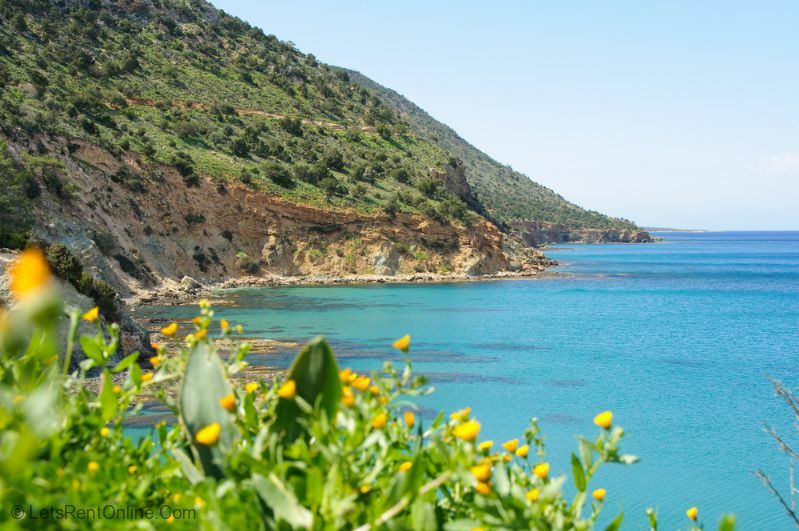 You are only a 5-7 minute drive from Coral Bay, Peyia village and 20 minutes into Paphos town. 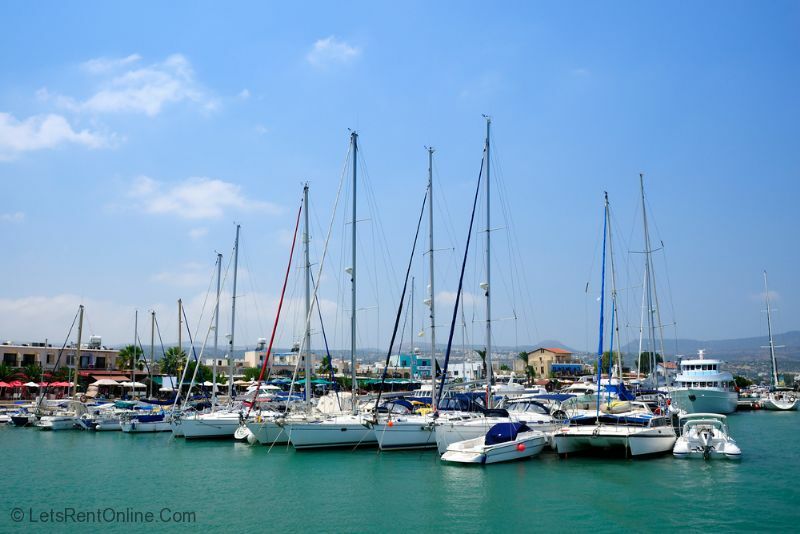 Easy access can be gained to the beautifully traditional village of Kathikas and you can also easily reach Polis and Latchi on the other side. 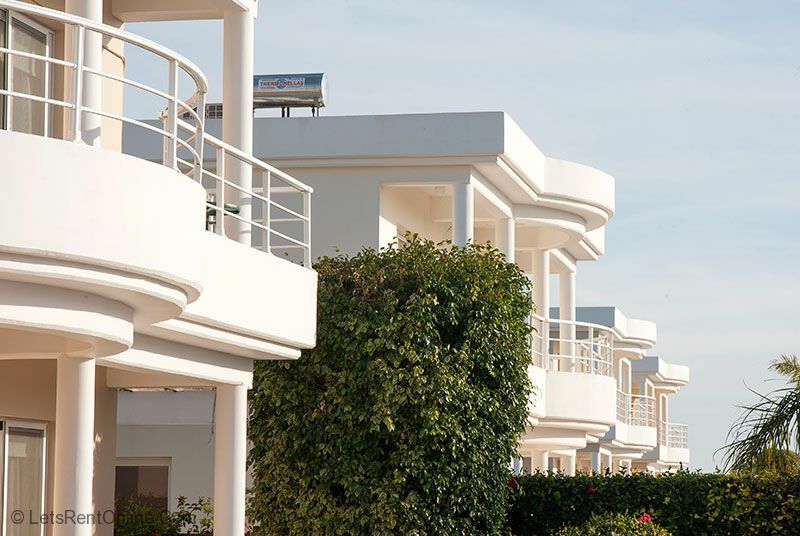 As previously mentioned, the beach and coastline can be walked to (going past some very nice and upmarket gated villas may we add) in under 10 minutes with a choice of routes and areas of coastline to enjoy. 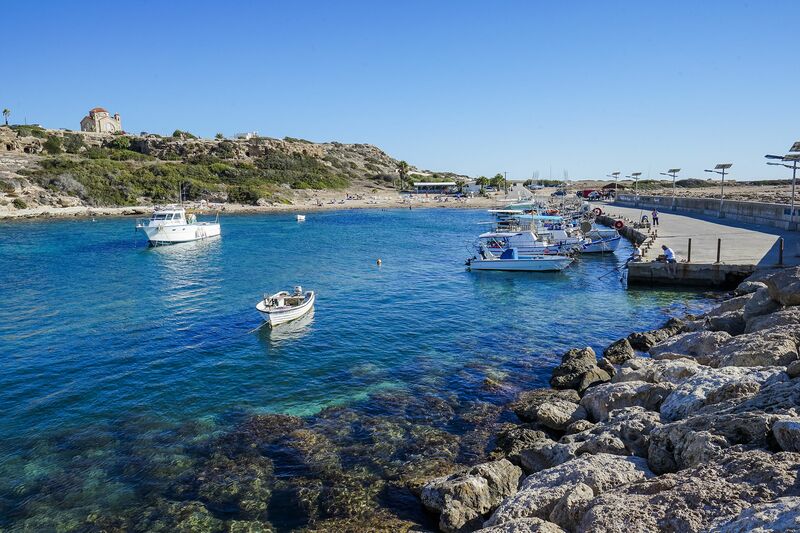 Agios Georgios has a renowned fish taverna where fresh fish is brought from fishing vessels that are stationed in the picturesque harbour situated directly below. 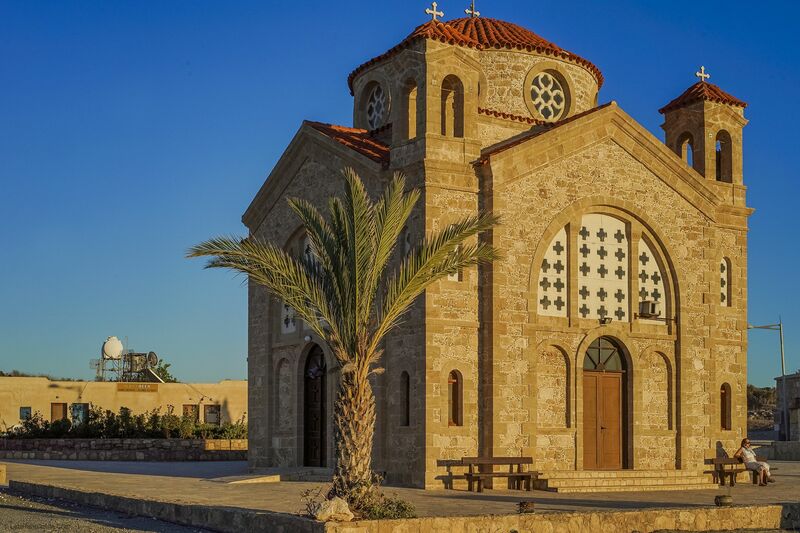 The monastery at Agios Georgios is beautifully architectured and is always a draw for visitors to the area. 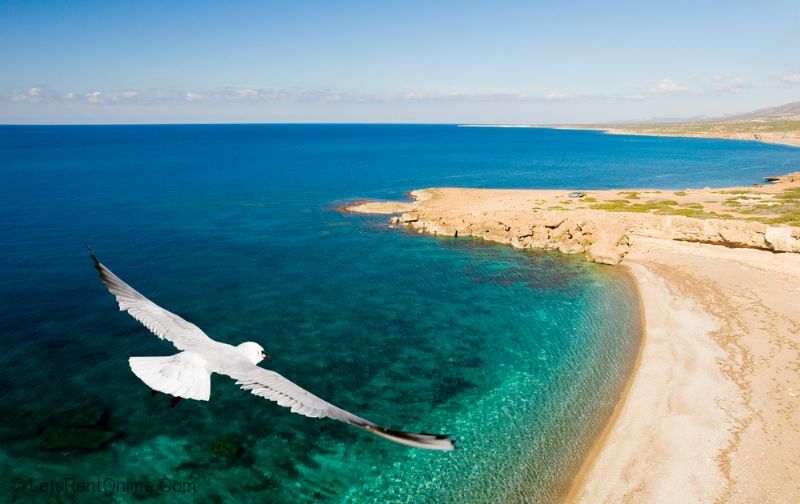 Other things to do in the area include Paphos Bird Park (now Paphos Zoo), reptile park, horse riding, Akamas Peninsular & Lara Nature Reserve, hiking/walking, buggy safaris, 4 x 4 safaris, sea caves area, sailing and many more. 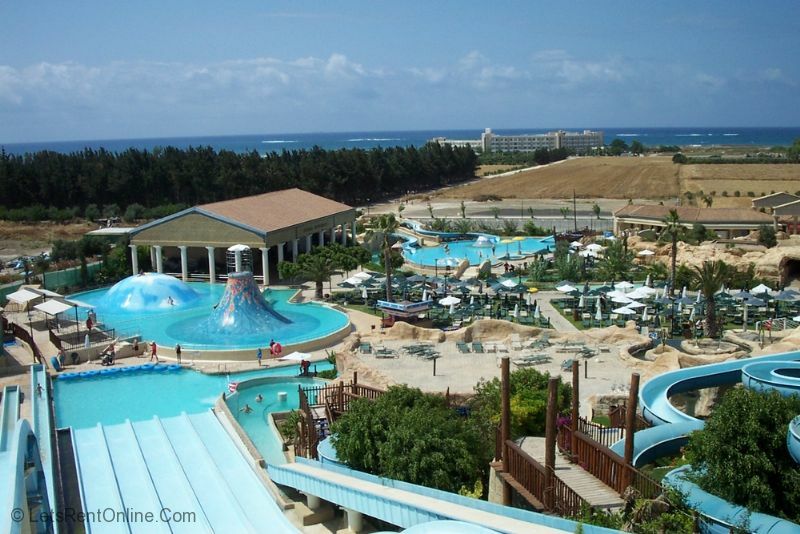 Amusement and water parks in Paphos are also easily accessible from Coral Bay as are numerous archaeological ruins such as the Tombs of the Kings. Golf can be found at Minthis Hills, Elea Estate, Secret Valley & Aphrodite Hills, all within 45 minutes drive of the villa. 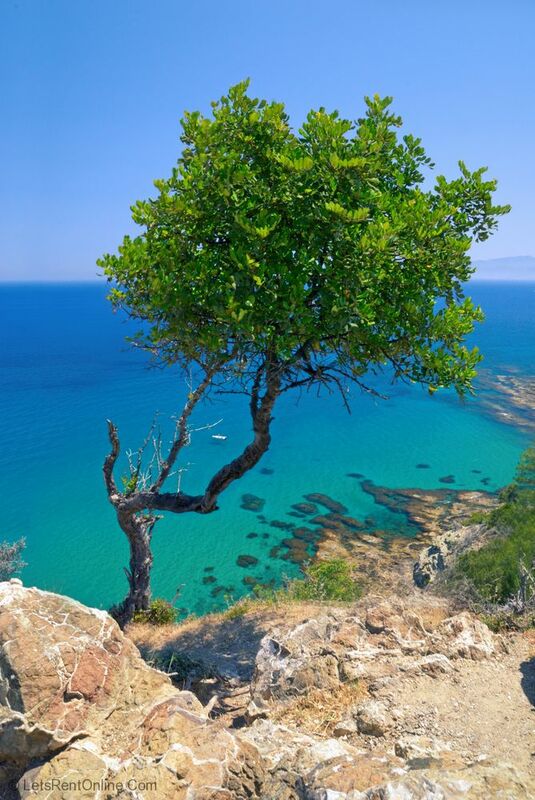 If you want to get out and explore some fantastic scenery, take a trip to the Akamas, Polis, Latchi or even Troodos mountains. 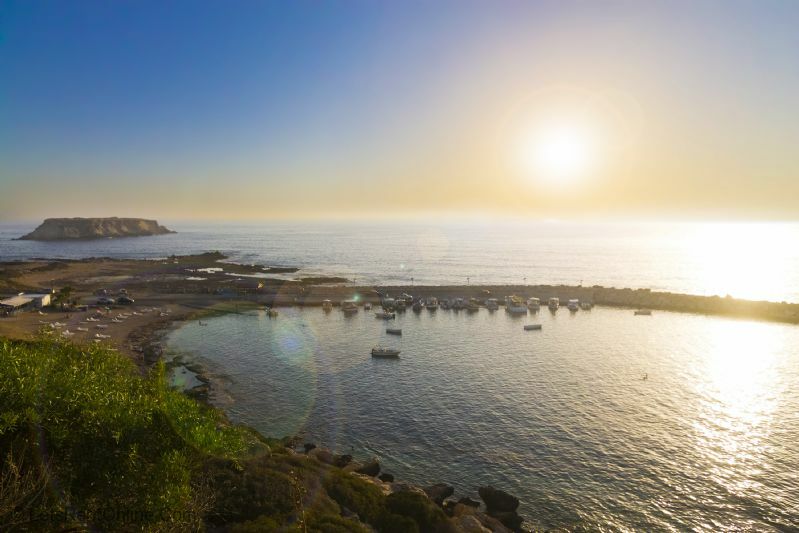 The Akamas is an untouched part of Cyprus with unspoilt coastline and traditional fish taverns in stunning seaside locations. Troodos is of course the main mountain range in Cyprus, not many people know that in the winter....you can ski! 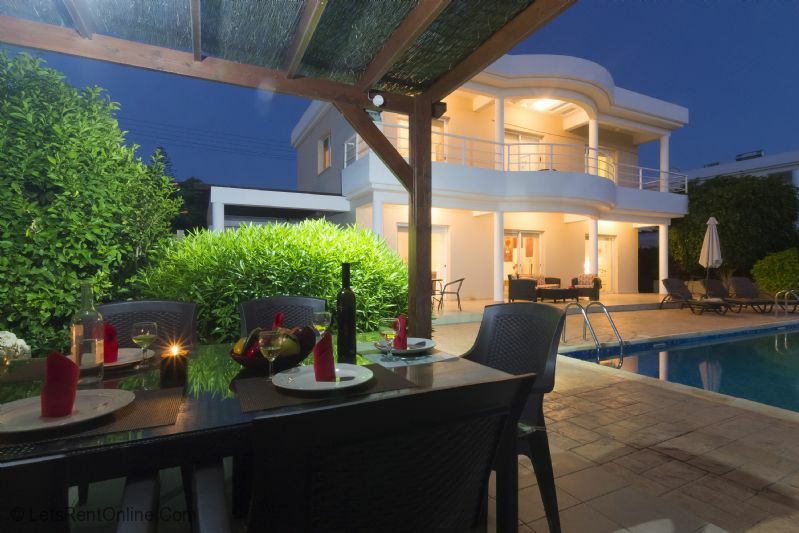 Skytrees Villa in Agios Georgios may well be the perfect location for a vacation retreat. 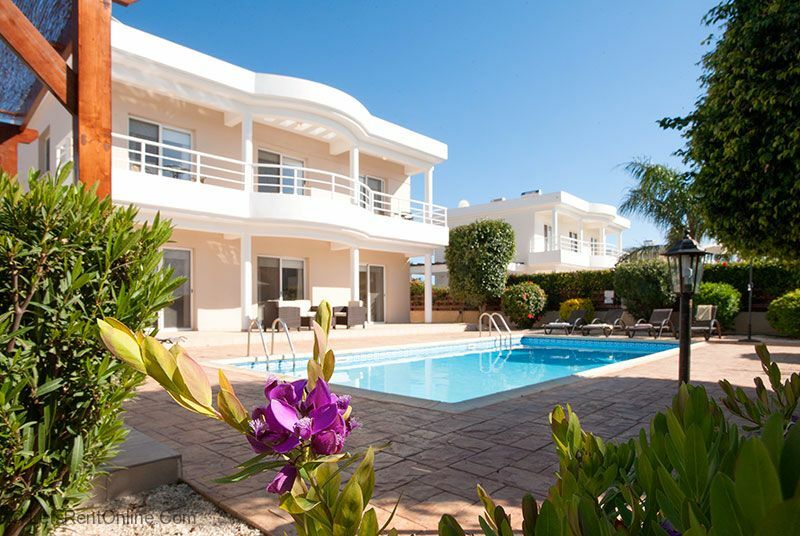 Access to the property is anytime from 3pm on arrival.Guests must vacate the villa by 11am on the day of departure.